Gracious guestrooms and suites are exquisitely appointed and thoughtfully designed to comfort the guest to relax his body mind & soul . We have 174 well-appointed rooms and suites offering comfort and convenience. Everything you need to ensure your stay in Chennai is productive as well as comfortable. Explore ‘essence suite’ specially designed to indulge in blissful experience. The deluxe rooms cast a cinematic spell with its rich and well furnished facilities. Decorated with double beds, cozy duvets and feather pillows and soothing room lights , your stay will be a guarantee of admiration. 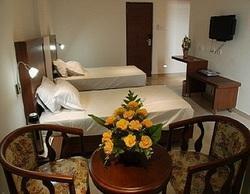 The Suite Rooms offer a luxury accommodation in Jamshedpur for discerning business travellers. The rooms come with all standard hospitality amenities, Ultra Beds and large LED televisions for a reposeful and enjoyable stay. The Suite Rooms are more spacious than our other hotel rooms. A room that gives you the real feeling of excitement and complete satisfaction, equipped with the most reliable and contemporary facilities, giving you a fantastic experience - all your dreams cherished in a single place! Palatial spaces filled with luxury , our Presidential Suite include a lavish bedroom accompanied by a spacious living room. The epitome of world-class comfort. Our suites are designed to pamper. The room tariff includes, complimentary breakfast and beverage service, discount on dining at Ali’s BBQ & Grill House , additional in-room facilities include an iPad .+. The Suite Rooms are a lavish expression of corporate luxury. Magnificently appointed to give a feel of home, the Suite Rooms offer accommodation that is truly more than just comfortable with living room, bed room et al. An Ideal place to relax and unwind your day. Our Suites feature the best of everything living rooms, hypnotizing beds, and a pool-facing balcony to step out.